A Hippo Love Story opening line: He should not have been there. This opening line resonates through the book, which is the story of how Karen and Jean-Roger Paolillo came to be in Zimbabwe and set up the Turgwe Hippo Trust to look after the local hippopotamus’s. n 1992, when her geologist husband was sent to a remote bush camp in Zimbabwe at a time of severe drought, Karen Paolilo stepped in to save the lives of a group of hippos who were going to die. With help from the British animal charity Care for the Wild International, she raised over 26 000 pounds to feed them and give them their own artificial water source as their habitat, the Turgwe River, had completely dried up. The husband and wife team, with their Hippo friends, have been through natural disasters such as floods, land invasions and having their lives threatened by guns, mobs and violence. The area they now live in with the hippos is called the Save Valley Conservancy. 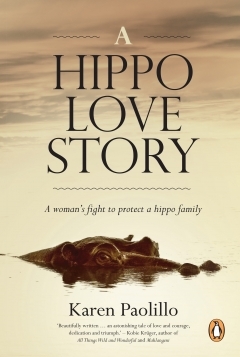 Since Karen’s intervention and the formation of the Turgwe Hippo Trust, the hippos have prospered, but not without severe stress and pressures upon her and her husband. This is the story of her life, of how an English girl came to womanhood and found her dream, a dream that has at times been harder than one could ever have imagined. I found the book an OK read, with the narration rambling a bit and the thread of the story moving quite quickly. It details the horror of drought and floods, and even worse, the horror of land invasions and death by the so called war veterans of a country where my father was born. The book costs R240 in the stores but personally I think that if you are going to spend the money, rather donate to the cause. Have a great holiday – Tandy – and look forward to hearing about your adventures when you get back.